The men’s adjustable tank combines the superior qualities of powernet fabric with adjustable hook-and-eye closure for an incredibly comfortable, yet highly effective chest support tank. Exceptional craftsmanship and breathable unisex design make this one of our most popular compression shirts. 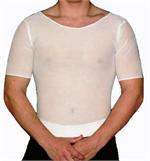 The pull-on shirt is a slim-line, powernet garment featuring a comfortable 2-inch non-rolling waistband. The pull-on tank combines quality and comfort for a breathable, powernet design featuring a 2-inch non-rolling waistband. Ideal post-surgical chest support.